Derries is outstanding and under-used! 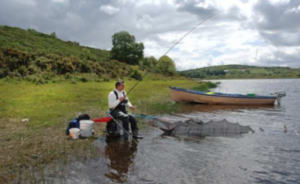 This is a fishery with easy access where anglers can drive to more than a dozen pegs or take a short walk to other fishable parts of the shoreline. Choose your favourite method and start catching fish – that is what Derries is all about. Like much of the Gowna complex, there is a bite-a-cast from small skimmers, roach and hybrids, while the bream put in a regular appearance but will usually be found just a little further out. An ideal method is to fish a straight bomb and a long tail of at least one metre (3ft). Catapult balls of groundbait groundbait before every cast to attract and this will attract a lot of small fish activity to begin with, but is often followed by the bream. Access: Very good and cars can be driven along the shoreline Directions: From Gowna take the Cavan road and after about three miles turn tight at the sign for Derries Lake. Stay on the lane and drive past the lake’s launching area and turn right at the first cross roads. 100 metres along the lane there is a gate on the right providing access to the shore. There is no need to ask permission but please do respect the land.